If you canvas those that know me I’m sure there will be plethora of terms used to describe me. Eccentric is just one of them and I have absolutely no problem with that, as clearly I’m in very good company! Since we moved to Somerset, both Harry and myself have been delighted with how the styling of our home has resonated with writers, photographers and even location scouts. In under a decade Egford has featured in weekend supplements and several books on interiors. Most recently, we were delighted to invite Ros Byam Shaw into our home as she worked on her latest book ‘English Eccentrics‘. As a former features editor for World of Interiors, Ros has written several books on the subject and is seen as a leading commentator in her field. Those of us lucky enough to feature in its pages are described as ‘people with a strong sense of the visual and the courage and flair to be original’. Well I couldn’t be happier with that! Ros really captured how Egford is a manifestation of the many factors that influence the styling of our personal space; a style that has shaped the Holt Harrison Collections showcased at our Lillie Road shop (271 Lillie Road, Fulham, SW6 7LL). It’s the result of our time travelling the globe, our desire for the unique rather than the uniform, and our belief in bringing new life to often discarded and unloved items. So if the following statement appeals, get hold of a copy and you’ll see how delighted we were to feature amongst such great company. Long live individuality and if that means we’re eccentric, then Harry and I are paid up members and proud. 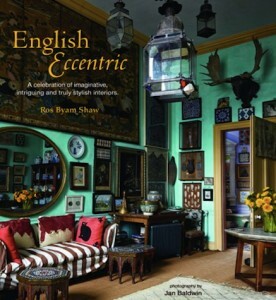 ‘English Eccentric is a book about interiors that will amuse and inspire in equal measure, and about people whose creativity, rather than wealth, informs their take on interior design’. Thanks Ros, magnificent work as ever.